With the exception of the Young Henry's Natural Lager - I thought this looked like a really solid pack. Three lightish Pale Ale's was probably a little over the top, but the variety of styles on offer from the 4 single offerings more than made up for it. I was most excited to try the summer seasonal from Green Beacon, their Scrimshaw IPA made with all Aussie hops. Henty St Ale is the latest release from Rover Beer, an offshoot range from Hawkers. I've never quite understood why they choose to split the Rover beers away from their regular range but that is beside the point. A Pale Ale from Hawkers clocking in at only 4.3% is something I can definitely get around! "This sits somewhere between the Rover Session Ale and the Rover Session IPA in terms of flavour profile, with less tropical fruit than the Session Ale and a drier finish. It’s a solid session beer, one that I could (and no doubt will) happily put away, but I do find myself a little sad that the Session Ale won’t be canned as I do prefer that beer overall." I was somewhat surprised that I had not had this beer in packaged form before. I'm continually impressed with all the Mismatch beers that I try; their Evil Archie Red IPA won our Red Ale blind tasting, beating out beers like Former Tenant! I remember being really impressed last time I had this beer with how much flavour they packed into it's 4% ABV body. "Surprisingly tasty. Lots of peach/apricot from the hops, dry finish, body isn’t too thin. Does quite a lot with the 4% ABV it has. Of the easy drinking beers this month I think this was the pick." I thought it was a genuinely strange choice to include a Young Henrys beer in The Beer-thusiast Pack. The brewery has never gripped me, having a sort of macro feel - despite it clearly being a craft brewery, maybe it's the widespread Dan's availability in the days before craft beer was regularly stocked... This lager has been pouring at their brewery since the day they opened and is billed as a Kellerbier - which is basically an unfiltered German Lager. "If the Mismatch Session Ale was the pick of the session/easy drinking cans, this was at the other end of the spectrum. I’d had this beer before and not been much of a fan, but was happy to give it another go in case I’d had a bad can in the past. I don’t think I had. It’s a weirdly sweet, stale tasting lager that doesn’t really have any characteristics to balance those flavours out. Bitterness is super low and it’s not particularly ‘clean’ in terms of flavours and balance. Craft lagers are really getting too good to spend time drinking beers like this." 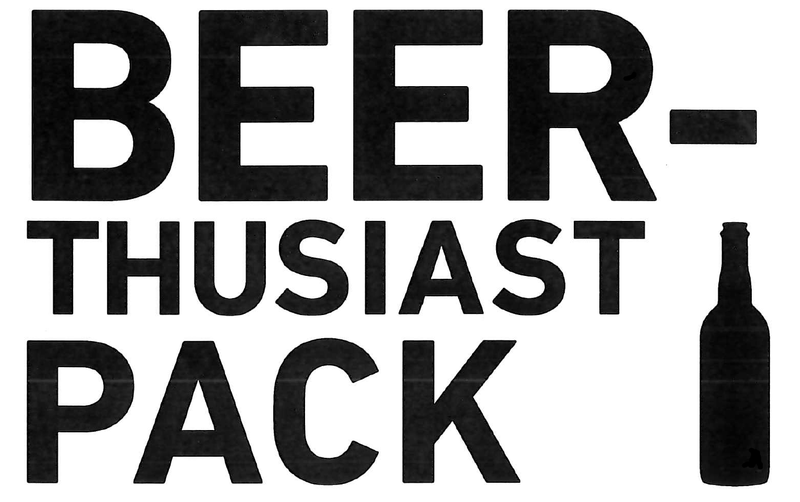 Bentspoke are the biggest brewery in Canberra, our capital city. Bentspoke produce a heap of really really good beers. In the last couple of years they've really expanded their distribution and have seen their standing in the craft community increase exponentially. This Pale Ale is one that has never really agreed with me - so we'll see how we get on. "Bentspoke make some awesome stuff but I found this too lightly flavoured. It’s a relatively low ABV beer obviously geared towards putting away quickly, with mild hop flavour/bitterness and a fairly smooth body. It’s not a bad beer, but there’s just not much to it." I don't think this beer is ever going to really do it for me. As Dylan said, it's not a bad beer there just are a heap more better options out there! I was really excited when I heard that Blackman's were collaborating with Barrow Boys. Both produce really good beers in their own right and I was really keen to see what they'd come up with together. The result was a Blueberry & Violet Gose, with the salinity coming from the ocean directly in front of Blackman's Torquay brewery. "I’m a big fan of both these breweries so this was a fairly exciting collaboration to see. I didn’t mind Blackman’s Blackberry Gose from early last year but found it a little cloying near the end of the can. This avoids that problem - it’s a stupidly refreshing beer, with a really nice balance of fruit/salinity. I’d like a bit more tartness but I’d happily recommend this as an entry level or session sour." Queensland was long a craft beer wasteland. 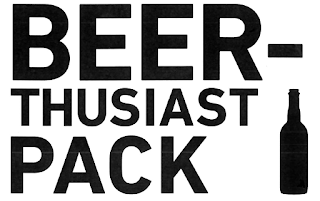 Since Green Beacon was established in 2013 the Brisbane craft beer scene has gone from strength to strength. In 2017 they were chosen by Singapore Airlines to provide beers for their Brisbane to Singapore flight. Scrimshaw is their limited release IPA for summer, showcasing Australian hops. "Green Beacon had a big 2017 - it felt like their name was constantly popping up, especially in the latter half of the year. This may well have been my favourite beer of theirs I had, with beautifully big hop flavours pushing out resinous fruit and some lightly grassy notes without the bitterness getting too high for the body to handle. It’s a really well balanced hop bomb. Looks lovely too. " 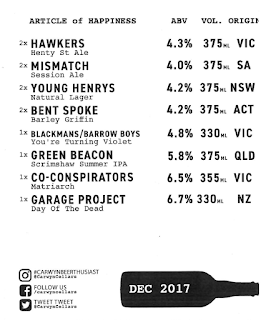 Co-Conspirator's are a Melbourne based Gyspy brewer and produce seriously good stuff. They seem to slide under the radar from time to time, so I was really pleased to see The Matriarch get into The Beer-Thusiast Pack and hopefully in front of a wider audience. The Matriarch is one of the first Australian NEIPA's that I can remember being released and is a damn good one at that! "This was one of the first NEIPA’s I had in the haze rush last year and it remains close to the top of the pack. When all are fresh I’d take it over Jedi Juice and Juicy. Huge amounts of orange, mango and pineapple hit you up front, with a really well crafted soft, full body and a lip smacking finish. The IBUs are listed at 47 which is a little surprising, as the bitterness on the palate is quite low. This is one of the local NEIPA’s I’d point to as not having the issue of the bitterness to style ratio being off (which seems a somewhat common problem) and I’d put that down to how full bodied and in harmony it is." Garage Project are known for producing consistently excellent beers. They're probably equally well known for doing so with some weird ingredients from time to time. Day of the Dead is one such beer, brewed every October to commemorate the famous Mexican holiday of the same name, it's a strong dark lager with heaps of chili & cocoa added. "This can weirdly had next to no chilli in it! You really had to look for it which was a surprise, as in the past it has been easily perceptible. Luckily it’s still a very tasty dark lager, with smooth roast and dark chocolate flavours. It does lose a little zing without the chilli though, it’s obviously crafted with the intention of having that flavour far more present than it was when we had it." I'm a bit embarrassed how long it has taken me to get this review up - life has been crazily busy for the last few months. If things go to plan; January's review should be up by the end of the week. I've got to work out what I'm doing with the Untappd badges review - it's been a very long time since I've done one! Hopefully there will be plenty of new material on the blog in the coming weeks!